Last year, Samsung walked out of the ashes of the Note 7 and launched the Galaxy S8, which was one of the best phones of 2017 and one of the best products Samsung ever made. So it’s not much of a surprise that this year’s Galaxy S9 and S9 Plus, which will be available for preorder on March 2nd and arrive in stores on March 16th, aren’t hugely different from the S8 phones. In fact, the Galaxy S9 and S9 Plus are so similar to their predecessors that on passing glance, they look and feel exactly the same. The S9 pair maintain the S8’s attractive and efficient design, with extra tall 18.5:9 screens, curved sides, and glass front and backs. 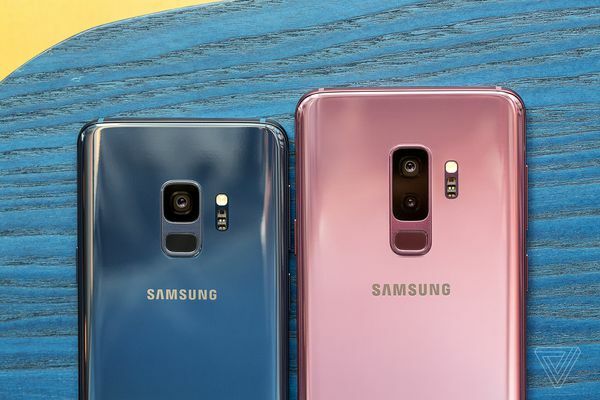 The 5.8-inch (S9) and 6.2-inch (S9 Plus) screens are the same Super AMOLED panels with 2960 x 1440 pixel resolutions, though Samsung says they are slightly brighter this year. Also interesting, though the phones look and feel the same as last year’s models, they have slightly different dimensions and weigh a little more, so don’t expect to be able to use an S8 case on an S9. The other reason you won’t be able to reuse cases is the one major exterior change: Samsung moved the fingerprint scanner from the right of the camera to below it, which should make it much easier to use, especially on the larger S9 Plus. Though it’s not an in-screen fingerprint scanner, as some might have hoped for, it will likely be a noticeable improvement over the old design. 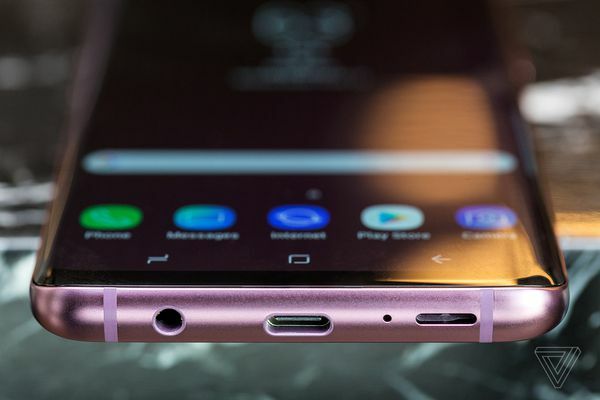 Otherwise, the button layout (including the dreaded Bixby button) and other hardware features, such as the 3.5mm headphone jack, remain the same as before. 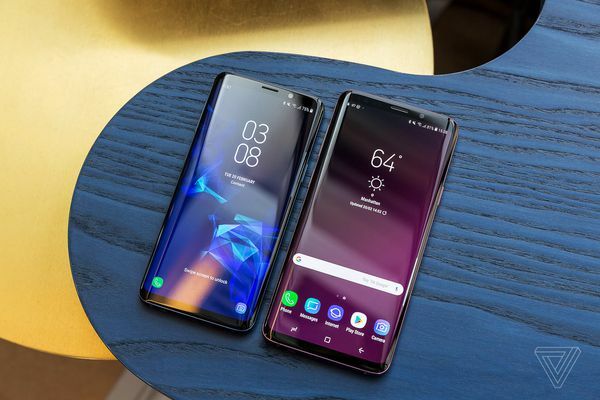 You won’t see the difference with the S9’s new speakers, which now produce stereo sound and are 40 percent louder, according to Samsung, but you’ll sure be able to hear them. If you’ve been following the numerous leaks of the S9 ahead of today’s official announcement, none of the following will be a surprise, but I’ll confirm the specs for you here: the S9 runs Qualcomm’s Snapdragon 845 processor (in North America, other markets can expect to see Samsung’s latest Exynos processor); has either 4GB (S9) or 6GB (S9 Plus) of RAM; comes with 64GB of storage and support for microSD cards; has a 3,000mAh (S9) or 3,500mAh (S9 Plus) battery; is IP68 dust and water resistant; and supports both fast wired and fast wireless charging. Like the S8, the S9 is a gigabit phone, but this year it can support speeds up to 1.2Gbps and supports 600MHz frequencies for T-Mobile. The big, highlight new feature is the S9’s new camera system, which comes as a single lens on the S9 and a dual camera on the S9 Plus. The new camera is Samsung’s first with a mechanically adjustable aperture (not counting the China-only flip phone launched late last year), which can switch between a very bright f/1.5 to a smaller f/2.4 depending on exposure conditions. The bright aperture lets in 28 percent more light than the S8’s f/1.7 lens, and the f/2.4 aperture is said to help prevent overexposure in bright scenes, such as a sunny outdoor day. The camera app is able to switch between the apertures as necessary, or you can manually control them using the pro mode in the app. Of note: the aperture can switch between f/1.5 and f/2.4, but cannot be set to values in between. Still, two aperture options are basically twice as many as you get with any other phone. 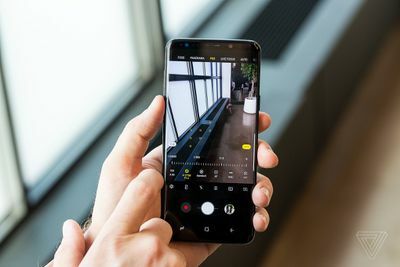 In addition to the new adjustable aperture, the S9’s 12-megapixel camera sensor includes second-generation dual-pixel autofocus tech for faster and more reliable focusing, improved multi-frame noise reduction for a claimed 30 percent better low-light performance, and the ability to record slow-motion video at up to 960 frames per second (at 720p resolution). The camera app has also been redesigned with quicker access to its various modes by swiping between them, much like how the iPhone’s camera app works. Copycat or not, it’s an improvement over the old app. 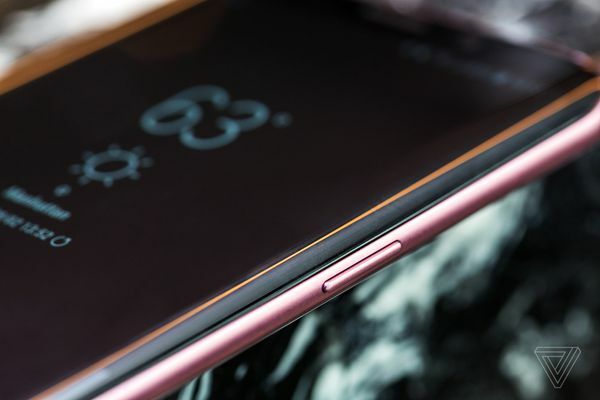 The S9 Plus’ second rear camera does not have the variable aperture feature but works similarly to the Note 8’s dual camera system. It has an f/2.4 lens that gets you two times closer to your subject than the wide-angle camera and allows for portrait-mode blurring effects (which Samsung calls “Live Focus”). Both phones have the same 8-megapixel f/1.7 autofocus front camera as last year’s models. Integrated into the new camera app is Samsung’s take on the iPhone X’s Animoji, which it calls AR Emoji. 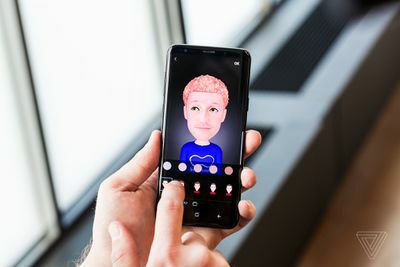 It lets you capture an image of your face, and using over 100 points, it builds a custom 3D character with your features. The app then creates 18 animated GIF “stickers” that are accessible in the keyboard for use in messaging apps. You can customize the look of your character with different hairstyles, glasses, and outfits, as well. AR Emoji aren’t quite the same as Animoji — the tracking isn’t nearly as precise and it’s not animals — but it’s more similar to a 3D Bitmoji character. For software, the S9 will launch with Android 8.0 Oreo, but much like the hardware, the design isn’t hugely different from the software on the S8. Samsung has redesigned parts of the Bixby app, most notably the camera features, which can now be used to estimate calories in food and provide faster real-time translation. The company has signed up new partnerships with retailers such as Sam’s Club and Nordstrom to let you purchase items directly through Bixby, as well as makeup from Sephora and Cover Girl. The Galaxy S9 and S9 Plus work with the same Gear VR that launched alongside the Note 8, as well as Google’s Daydream View headset. They also work with last year’s DeX Station, which lets you use the phone as a full computer with a monitor, keyboard, and mouse. Samsung is also releasing a new DeX device called the DeX Pad. The Pad does not prop the phone up like the station, but instead allows it to lie flat, where it can be used as a trackpad or keyboard. The S9 can support external displays up to 2K resolution, and Samsung says it has signed up between 30 and 40 partners to make DeX optimized applications. One of those is the Final Fantasy XV, which will come preloaded on the device. Though Samsung didn’t make a lot of changes to its formula for the S9, the ones it did make should be appreciated, and it will likely be a popular phone this year. It’s interesting how there are more things different between the smaller S9 and larger S9 Plus this year, which might make it harder for those looking for a compact phone with all of the bells and whistles. The S9 will be available on all major carriers in the US as well as unlocked direct from Samsung. Pricing for the unlocked models is $719.99 and $839.99 , while carrier pricing ranges from $720 and $840 to $800 and $930. 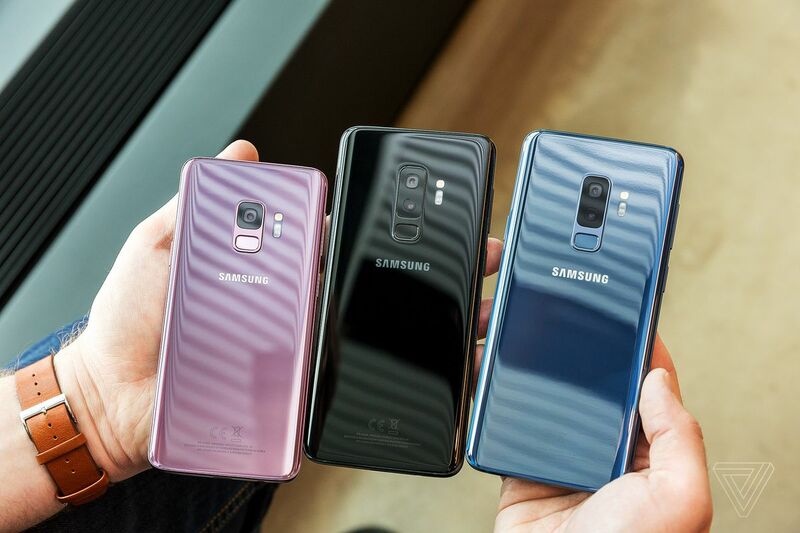 US customers will be able to choose between black, purple, or blue color options at launch, while a grey model will also be available internationally. It’s likely that other color options will be made available later in the year. We’ll have plenty more to say about the Galaxy S9 and S9 Plus in the coming weeks, so stay tuned.